The floors, ceilings, and architecture were gorgeous and difficult to photograph. The building didn’t just house art; it is art. Claude Monet (1840-1926). The Water-Lily Pond, 1899. 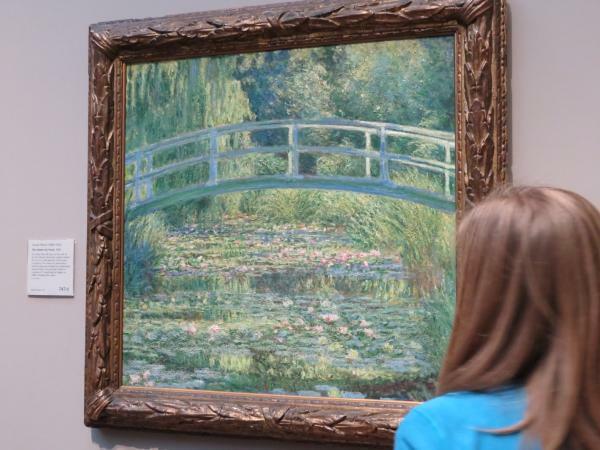 For more than 30 years at the end of his life, Monet found the subject matter for his art in the gardens at his home in Giverny. The water-lily pond there and the Japanese bridge he constructed across it were the principal motifs in a group of 17 paintings he began in 1899, including this work. (Museum description of the piece). Luca Giordano (1634-1705) Perseus turning Phineas and his followers to Stone, early 1680s. 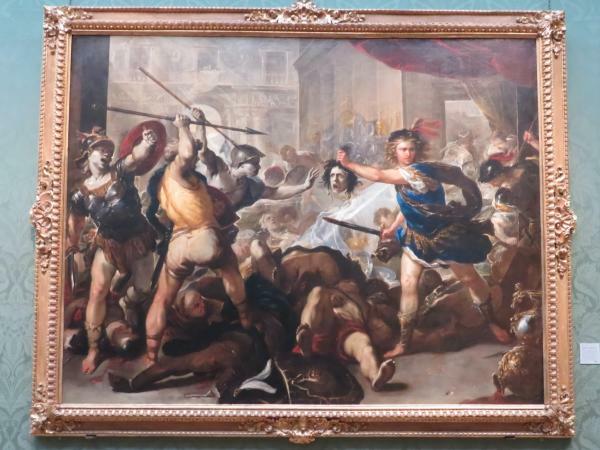 As told in Ovid’s Metamorphoses, Perseus was celebrating his marriage to Andromeda when her previous suitor, Phineas, burst in to kill his rival. 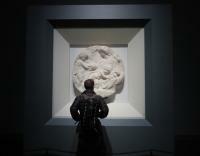 Perseus revealed the head of the Gorgon, Medusa, thus turning his enemies to stone. The newly acquired frame is a striking example of a Florentine mid-17th century design with finely carved cartouche centres and corner masks. (Museum description of the piece). Adolph Menzel (1815-1905). Blind Man’s Buff, 1867. 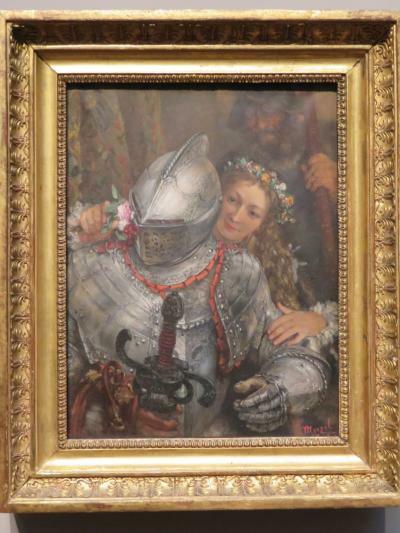 A young girl announces her presence to the man in armour by thrusting flowers at him. We see only his merry eyes. Yet this frivolous game is overshadowed by a glowering figure behind. Menzel is a master at depicting surfaces, hard and soft, and at suggesting enigmatic psychological states. (Museum description of the piece). Michelangelo (1475-1564) The Virgin and Child with the Infant Saint John the Baptist (‘The Taddei Tondo’), about 1504-1505. The virgin caresses the young Baptist who offers her Son a fluttering goldfinch, symbolic of Christ’s later suffering. He shies away, but looks back, awakening to his fate. While his facial expression is neutral, as in a classical sculpture, his dynamically posed body, inspired by Leonardo, is distinctly expressive. 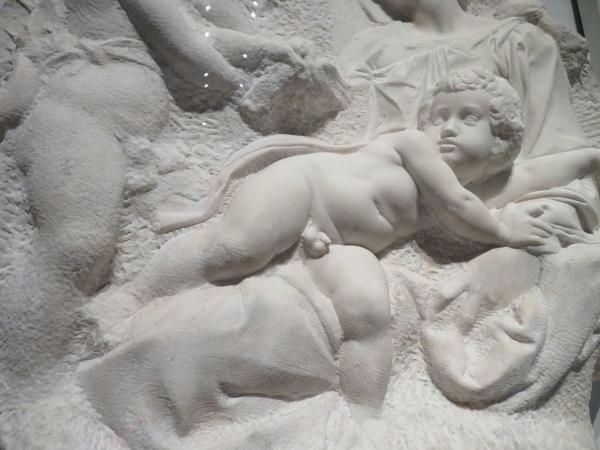 The relief is probably unfinished, but the varying levels of completion and texturing are at least partially intentional, typical of Michelangelo’s developing aesthetic at the time. This tondo (roundel) is named after the Florentine patron, Taddeo Taddei, for whom it was made. (Museum description of the piece). Close up of The Virgin and Child with the Infant Saint John the Baptist (‘The Taddei Tondo’)k, about 1504-1505. Vincent van Gogh (1853-1890). Sunflowers, 1888. Van Gogh associated the colour yellow with hope and friendship. 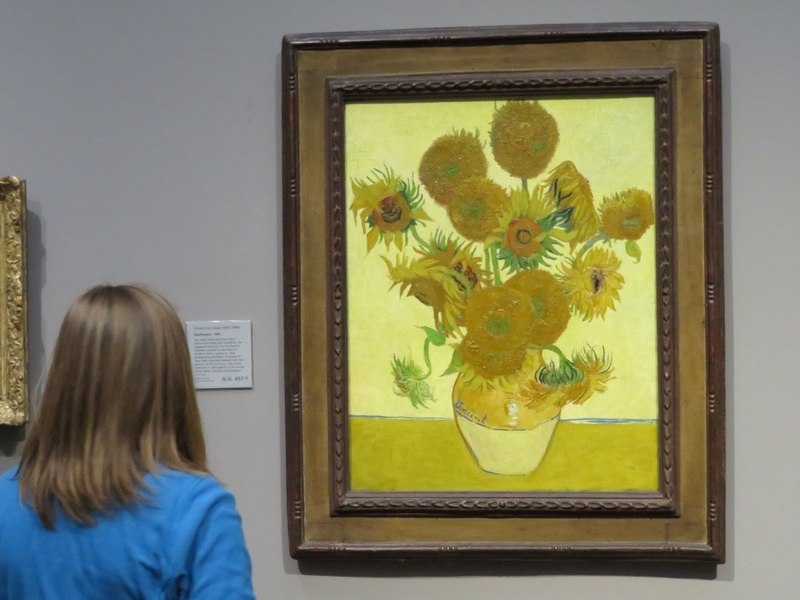 He suggested that his four Sunflowers canvases, painted to decorate his house in Arles, express an ‘idea of symbolising gratitude’. He seems to have been especially pleased with this picture, which he hung in the guest bedroom in anticipation of the arrival of his friend, the artist Paul Gauguin. Leonardo da Vinci (1452-1519). The Burlington House Cartoon, about 1499-1500. The Virgin sits on the lap of her mother, Saint Anne. The Christ child blesses his cousin Saint John the Baptist. This large drawing is a cartoon: a life-size preparatory study for a painting. In order to transfer a design onto a panel, the outlines of cartoons were usually pricked or incised. This is not the case here, as the drawing remains intact. It must have been preserved in its own right as a finished work, although some areas are deliberately left inconclusive. Leonardo exhibited a cartoon of the subject in Florence in 1501, making a profound impression on Michelangelo who responded in his Taddei Tondo. 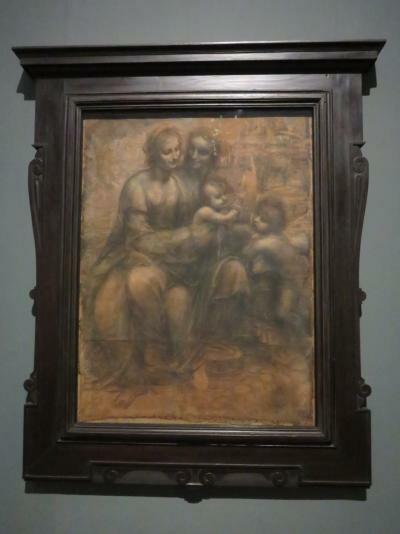 The design of that lost cartoon is probably preserved in Leonardo’s painting of the subject in the Lourve. (Museum description of the piece). Leonardo da Vinci (1452-1519). The Virgin of the Rocks, about 1491/2-0 and 1506-8. The Christ Child, at right supported by an angel, blesses his cousin, the infant Saint John the Baptist, who folds his hands in prayer. The Virgin connects the two by holding out one hand above her Son, while touching John’s shoulder with another. 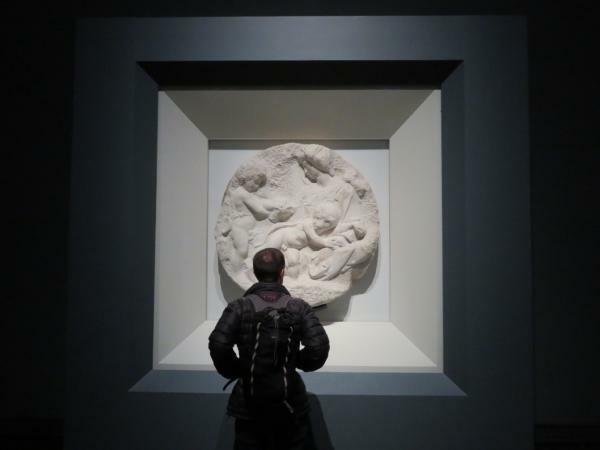 Leonardo’s sophisticated rendering of figurines interacting in three-dimensional space was ground-breaking and became crucial for Raphael. The theme of the painting is the doctrine of the immaculate Conception, which entailed the belief that though born of human parents, Mary was preserved from original sin. Her serene beauty and the carefully studied primordial setting, untouched by human hands, emphasizes her purity and role as intermediary for Mankind. (Museum description of the piece). Raphael (1483-1520). 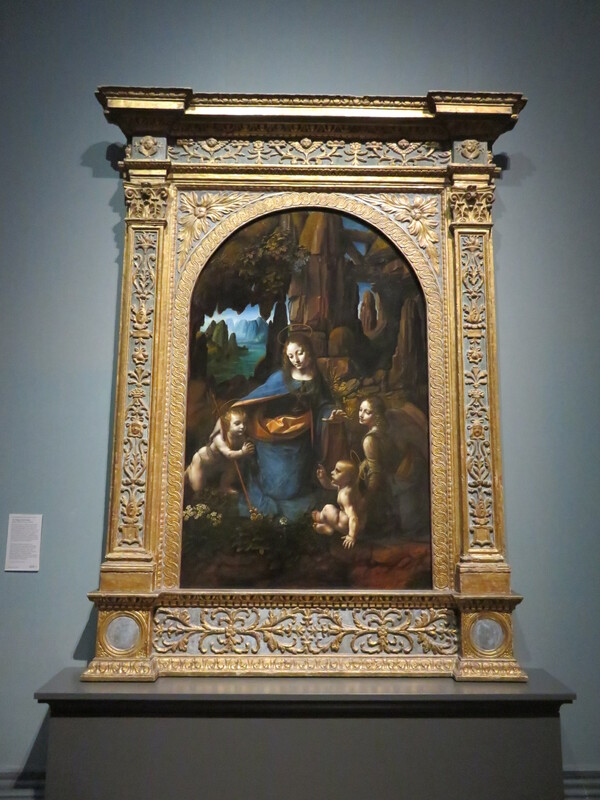 The Ansidei Madonna, 1505. Raphael painted this altarpiece for the chapel of the Ansidei family in the church of San Fiorenzo in Perugia. Responding to the challenge of its restricted setting, Raphael was inspired to produce on of the most imposing and resolved altarpieces of his early career. 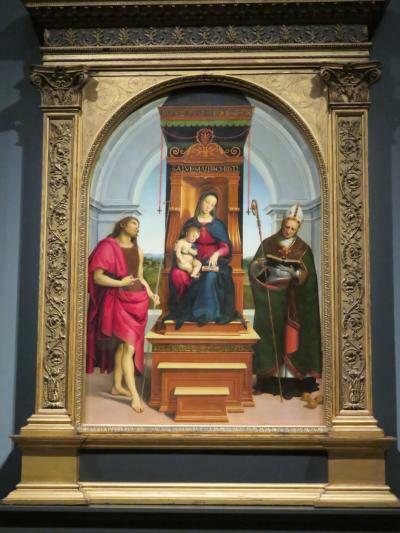 The Virgin is flanked by Nicholas of Bari and John the Baptist, name saints of the patron and his son. The Baptist gazes up at his slender crystal cross and points towards Christ, foreseeing his passion. The altarpiece’s division into harmonious thirds is the result of careful geometrical planning. Surprisingly, however, the lofty vaulted architecture was an afterthought, added when the painting was well advanced. The brilliance of Raphael’s solution was to create the illusion of a chapel-like space where none may have existed.